Recordings of Pierre de la Rue’s Requiem Mass are not a common occurrence in the CD catalogue. The piece was recorded by the New London Chamber Choir, under James Wood, in 1985 and subsequently by The Clerks Group under Edward Wickham in 2006. 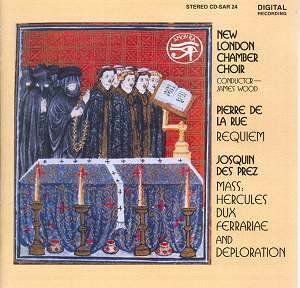 Now the New London Chamber Choir recording has been re-issued on the Amon Ra label. De La Rue probably wrote his Requiem Mass in emulation of Ockeghem’s Requiem. De La Rue’s work is based on the plainchant requiem mass and each movement moves easily from plainchant to polyphony, with the polyphony including the plainchant cantus firmus. Previous reviews of this disc, and of the recording by the Clerks Group, talk of the eccentricities and problems of this work. But frankly, in this recording it is very approachable. The choir sing with a lovely warm tone and there are only slight occasions when you detect a lack of unanimity. The result is a good standard recording of the work, but…. I did wonder what de la Rue’s mass would sound like recorded with a smaller group singing a medieval tuning rather the modern standard tuning. Though James Wood and his singers give de la Rue his due, I could not help feeling that something of the works early exoticism was missing in this performance; that it had been given the standard Western choral treatment. In his 1987 Gramophone review David Fallows describes this work as ‘one of the most puzzling works of its generation’. Somehow, I feel that James Wood and his choir miss this element. But they do provide a performance of fine musicality. They pair the work with Josquin’s Missa ‘Hercules Dux Ferrariae’. The choir change their tone significantly for this work and provide a strikingly robust performance. The mass is probably one of the earliest of the composer’s settings to be based, not on plainchant or a popular song but on an entirely original motto theme. The theme which gives the work its name is based on the dedicatee’s name – Hercules Dux Ferrariae. Finally the choir perform Josquin’s Deploration for Johannes Ockeghem; a wonderful lament for the composer written in or around 1497 when Ockeghem died. With music as early as this, we have to decide whether we want to hear a performance which attempts to reconstruct the sound-world of the composers or which projects the music into our own place and time. These performances do the latter, but do it in a fine, musical manner. Only occasionally did I wish that the high gloss performance was replaced by something a little rasping, that the standard modern tonality was replaced by a more strident early tuning. This is an attractive disc and only occasionally do the choir’s very high standards lapse. Perhaps, nowadays, we might expect performances which reflect the tuning and tonality of the 1400s. But Wood and his choir display fine musicality and anyone wanting performances of these works need look no further.